How old are the loko iʻa, or fishponds? How do we know how old they are? What are loko iʻa used for? How does the system work? How is the mākāhā, or sluice gate, related to the idea of sustainability? In a loko iʻa, what is the difference between pua, or fingerlings, and natural predators? Give examples. Some families and organizations in Hawaiʻi are restoring traditional loko iʻa to be used as a food source. In what ways could these efforts help Hawaiʻi in the long term? What would you need to be able to construct a loko iʻa? How might you become involved in loko iʻa restoration? “ʻO nā loko iʻa, ʻo ia kekahi mau mea hoʻohiluhilu o ka ʻāina, a ua kapa ʻia he ʻāina momona no ka nui o nā loko iʻa"
Fishponds, loko iʻa, were things that beautified the land, and a land with many fishponds was called a ‘fat’ land (ʻāina momona). If you build a fishpond, the fish will come (and your hunger will go!). Learn how our kūpuna worked with their environment to create an efficient system of raising and harvesting fish. How did loko iʻa supplement the ʻohana’s food production? It took a lot of work to maintain some of the different types of loko iʻa, but the benefits were worth it. A well-kept loko iʻa produced seafood resources in different amounts for the ʻohana, depending on the type of pond. Sometimes the loko iʻa just produced a little food to supplement what the ʻohana grew or harvested from other parts of the land or sea, and sometimes the larger ponds, such as the loko kuapā, were major food suppliers for the area or the aliʻi. Some of the loko iʻa even worked together with other ways that the ʻohana grew food, such as the loko iʻa kalo. How did kānaka determine the best place to build a loko iʻa? Kānaka “listen” to the ʻāina (land) to determine the best place to build loko iʻa. Is there a fresh water source? Does this place have a protected area so fish will multiply? Kānaka come to understand the natural rhythms of the particular ʻāina and the proper protocols before choosing a site to build a fishpond. Kānaka are observant of ocean tides and currents. They navigated their canoes across the Pacific Ocean. They rode the ocean swells on their surfboards. Fishermen were keen to the movement of fish. They understood the changes in the season and how fish responded. The ancient wisdom of the fishermen led to the development of fishing methods and tools. They used their hands to catch fish in between the rocks. Nets were later invented along with spears and hooks. Eventually loko iʻa were developed. The fishing god Kūʻulakai built Hawaiʻi’s first loko iʻa at Hāna, Maui. 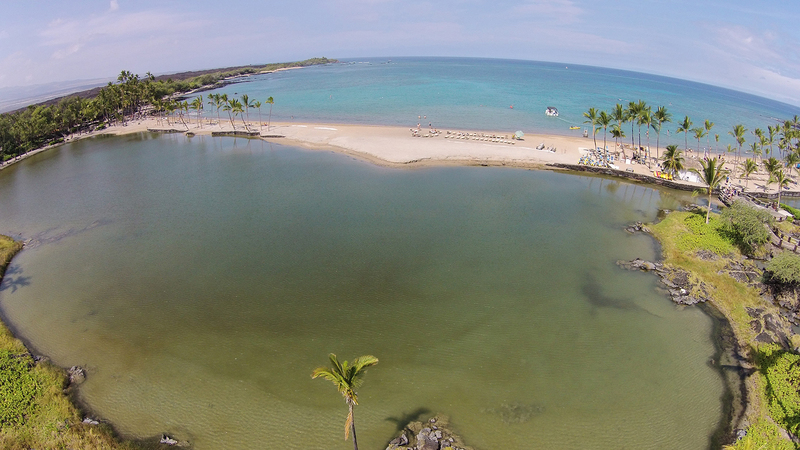 With this new fishing technology, our kūpuna raised and harvested fish from a walled pond. This made fishing for some kinds of fish faster and easier. There were two types of fishponds—shoreline and inland. Shoreline ponds were built along protected bays or seashores. This is where the loko kuapā and loko ʻume iki were built. Many ponds were constructed near fresh water or brackish springs. These were generally found in shallow ocean water or near the mouth of streams. Streams helped the loko iʻa. Stream water would wash inorganic material into the pond. The nutrient-rich water would help feed the fish. The fertile pond would also attract other fish, increasing the pond’s food supply. Inland ponds were designed to take in the natural shape of the land. The three most common were the loko wai, loko iʻa kalo, and the puʻuone. Most of the ponds were built and used by the people and their konohiki. A few were for the exclusive use of the aliʻi. 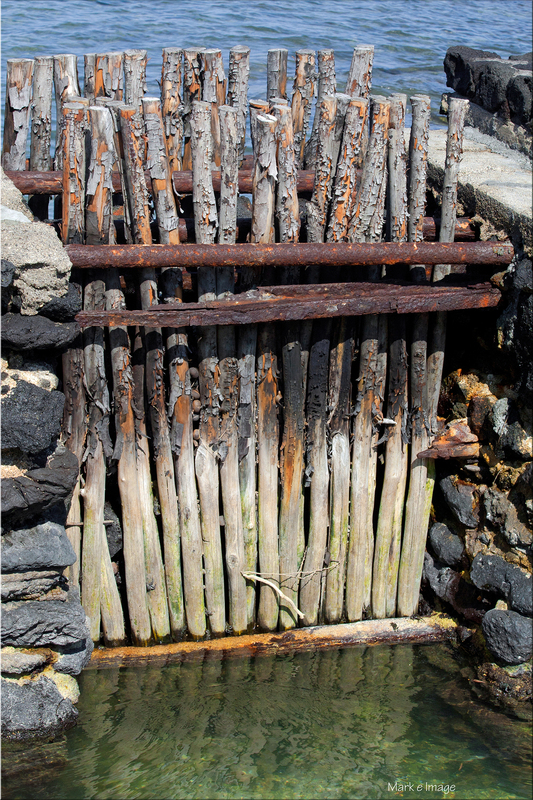 The ancient stones used to build the fishpond walls were harvested from the mountains. Aliʻi (chiefs) would summon several thousand people to pass stones from hand to hand. It took several years to build some fishponds. 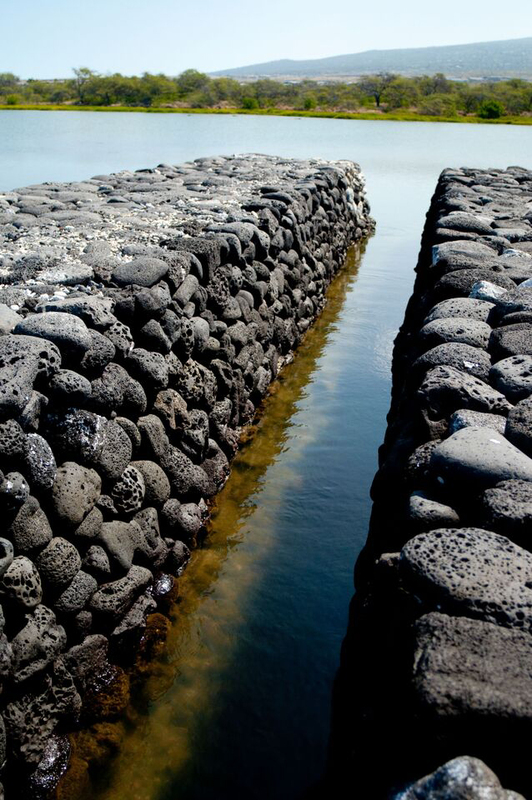 A specially trained person who builds fishpond walls would carefully put the stones in place. He was known as the kuhikuhipuʻuone or the architect of the fishpond. Who managed and maintained the fishpond? The konohiki managed the building and maintenance of the aliʻi fishponds. Heavy rains would often wash sediment into the shoreline loko iʻa. The fishpond was designed to remove the sediment. The incoming tide would enter through the water channel, moving the silt to the other side of the fishpond. The outgoing tide would carry the silt out of the pond and into the ocean. Some of the pond keepers would use a weighted bamboo rake, or kope ʻohe, to clean the fishpond. They would scoop debris and silt to the mākāhā. At the outgoing tide, the mud was swept into the ocean. Konohiki would call upon the commoners once or twice a year to help clean the fishpond. In some ponds, kānaka would be required to scoop mud into half coconut shells. The mud would be used to reinforce the banks of the fishpond wall. Removing the mud would create a firm bed on the floor of the loko iʻa. This was an ideal habitat for fish and plants to grow. Fish that are tolerant of both salt and fresh water environments are called euryhaline. Kānaka understood the biology of fish. That’s why near-shore fishponds were stocked with fish such as the ʻamaʻama and awa, because they adjusted well to brackish water conditions. What types of loko iʻa are there? 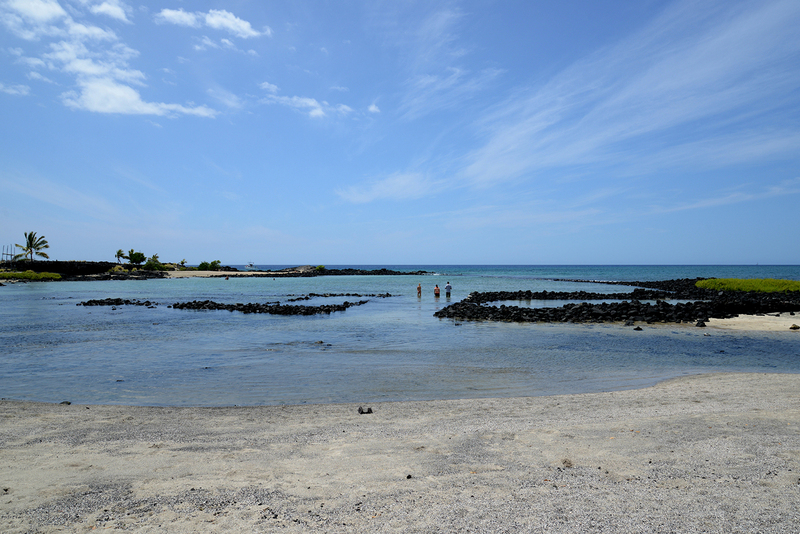 Loko iʻa are Hawaiian fishponds or fish traps. There are many different types of fishponds and fish traps. The most common fishponds are the loko kuapā, loko puʻuone, loko wai, and loko iʻa kalo. Fish traps are the loko ʻume iki and umu. The main difference between the fishpond and fish trap is the sluice gate, or mākāhā. The mākāhā is only found on the fishpond. The spaces in the gate are small enough to keep the larger fish in the pond and prevent them from escaping, but large enough to also allow water to circulate more freely in the pond. The most common loko iʻa is the loko kuapā. The loko kuapā are built on reef flats near freshwater streams or springs. The inner wall of the pond is the shoreline. The outer wall of the loko iʻa is built using coral and stones. There are openings in the outer wall called ʻauwai kai. These channels allow fresh and salt water to mix and flow freely in and out of the loko iʻa. The spaces in the sluice gate (mākāhā) allow pua iʻa or small fish fry to enter the pond. The mākāhā also traps the large fish in the loko iʻa so that they are unable to escape. The walls of the pond and the mākāhā work together as a “filter.” Together they help water circulate, prevent the fishpond water from becoming stagnant, and decrease sediment build up. Some loko kuapā have nurseries where the pua iʻa are kept to protect them from larger fish. The loko kuapā were originally built for the aliʻi (chiefs). No one was allowed to catch fish in the loko kuapā, only the aliʻi. The loko kuapā is found nowhere else in the world—only in Hawaiʻi. Loko wai are freshwater ponds found inland from the ocean. Natural pools are dug out to form loko wai. Streams flow through the ʻauwai (ditch) into the pond. Sometimes loko wai are built near springs. Fish are caught in the ocean and placed in the loko wai to grow. Freshwater fish, such as ʻoʻopu and ʻōpae, swim into the pond from the streams. Small mākāhā keep the larger fish from swimming back into the stream. Fish are harvested using ʻupena (woven fish nets). The ʻupena are placed across the opening of the ʻauwai to trap fish. The loko iʻa kalo (taro fishponds) are built in the mountains next to streams. Stream water flows into the pond through the ʻauwai (ditch). Fresh water flows to deeper loʻi ponds. The deeper ponds are where fish and kalo are grown. Kalo is planted in dirt mounds. When the loʻi kalo are flooded, the areas between the mounds are a great habitat for fish. Fish swim around the mounds in search of food. They feed on insects, limu (seaweed), and plants that fall into the pond. The mākāhā (sluice gate) keeps the larger fish from escaping. Kānaka stocked the loko iʻa kalo by gathering fish from brackish ponds near the shore. They would carry the fish in gourds several miles inland to release them into the loko iʻa kalo. 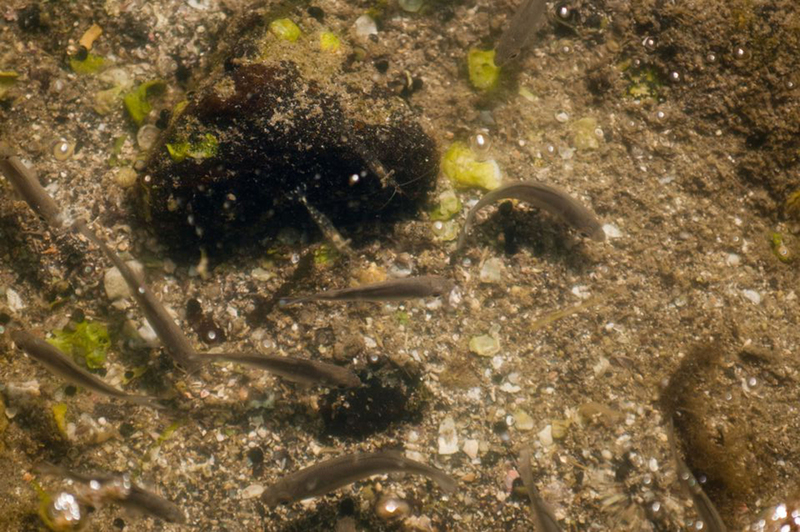 The makaʻāinana (commoners) often harvested awa (milkfish), ʻanae (mullet), ʻoʻopu (gobies), āholehole (silver perch), and ʻōpae ʻoehaʻa (clawed shrimp) from the loko iʻa kalo for food. The loko ʻume iki is a fish trap built on the reef flat. It has no mākāhā to keep the fish from leaving. The walls of the loko ʻume iki have many openings that look like funnel-shaped lanes. Some of the lanes are wider near the shore. Others are wider near the ocean. The lanes produce currents, which attract the fish. Women usually stand on the walls of the lanes during the changing of tides and harvest fish twice a day. On Molokaʻi, two districts shared a loko ʻume iki. When the tide rose, the people from Keawanui had the right to use the lanes. 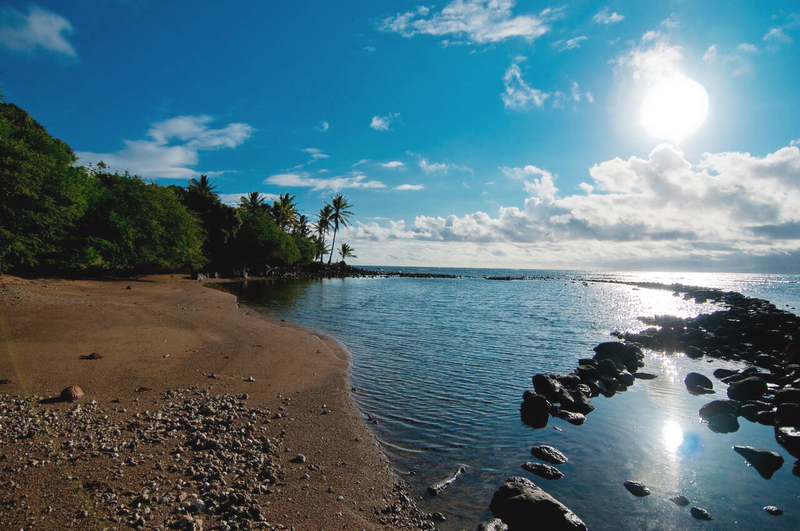 On the outgoing tides, the people of Kaʻamola would harvest fish. The simplest form of a fish trap is the umu. It is a large heap of rocks that are placed in the ocean near the shore. Kānaka build the fish traps by piling loose stones into a mound. Fish are attracted to the limu that cover the stones. Women place an ʻupena over the opening on one side of the umu. On the other side, they paʻi or slap the water with a coconut frond or stick to scare the fish into the ʻupena. Umu are not permanent fish traps. They were often destroyed during storms or raging surf. But they could be easily rebuilt. 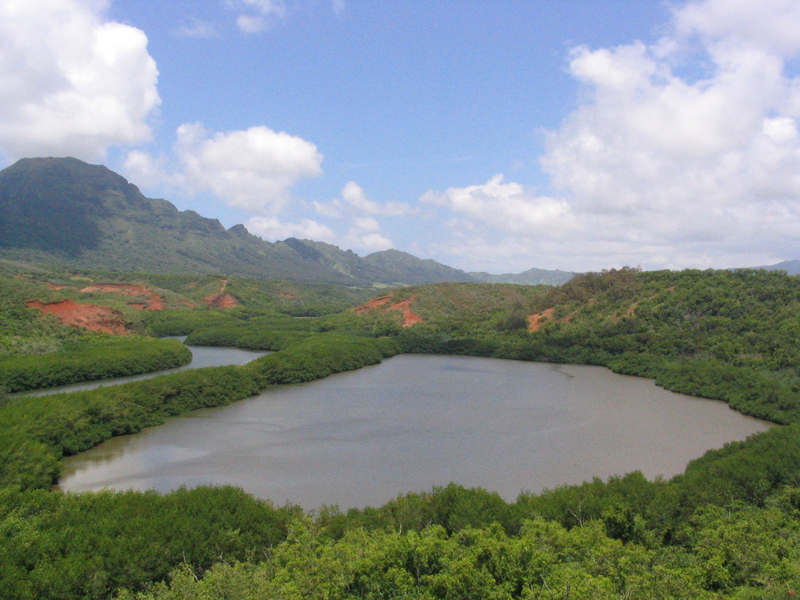 Kawainui Marsh on Oʻahu used to be a loko wai. A jelly-like material grew in the pond. During Kamehameha’s reign, this edible mud was served to his warriors instead of poi. Hū ka ʻono!